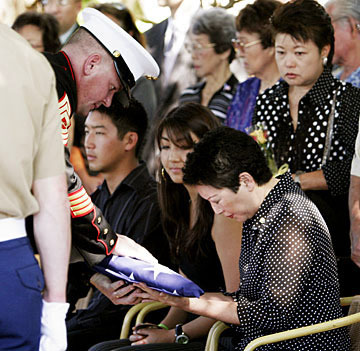 Debra Takemoto, mother of slain U.S. Marine Staff Sgt. Daniel Tsue, received an American flag during yesterday's service at Punchbowl. THEY CAME to Punchbowl to honor Staff Sgt. Daniel Tsue, who was killed in Iraq. Some did not know him, but paid their respects to a fellow bomb disposal expert. Honolulu police officer Ed Whitelock said a half-dozen members of the police bomb squad -- who did not know Tsue -- attended to honor a fellow technician. "We are all in the same community," Whitelock said. "We all work together for the common good." Among Tsue's mourners were Navy, Marine, Air Force and police bomb disposal experts who attended the 20-minute burial service yesterday at the National Memorial Cemetery of the Pacific's columbarium. The uniforms were of different shades and hues, and every one of the military members wore the small silver wreath surrounding a bomb on their breast, signifying completion of the Department of Defense's bomb school at Eglin Air Force Base in Florida. Tsue, 27, became the 72nd person with island ties to die in Iraq since the war began in 2003. He was killed Nov. 1 while responding to a request to neutralize a roadside bomb in Ramadi. "Daniel was very nonchalant about his work. It was another day of work. That's it, even with everything blowing up around him." Gunnery Sgt. Jose Soto, who was serving his third combat tour in Iraq as team leader before he was shot in the chest and arm last month, said Tsue, a 1996 Kahuku High School graduate, was a key member of his four-man squad. Tsue was responding to one of the more than 60 homemade-bomb calls he received since arriving in Iraq two months ago. "Daniel was very nonchalant about his work," said Soto. "It was another day of work. That's it, even with everything blowing up around him." Last month was especially hard for his bomb squad, Soto said. "We lost four men in Ramadi. They can lay IEDs (improvised explosive devices) as they wish." But Soto said it is Marines like Tsue "who make me want to do my job." "Tsue was the kind of guy who did the right thing because it was the right thing to do," Soto said. "Bottom line, he didn't care if anybody was watching. He didn't care if anybody saw him. He was a good man." During the brief service, Master Sgt. Frederick Gross, the highest-ranking noncommissioned officer in Tsue's Southern California unit, read the orders promoting the Hawaii Marine to staff sergeant. He also presented the promotion orders and Tsue's Purple Heart to his father, Richard. A seven-member Marine Corps honor guard fired three volleys that echoed through the quiet volcanic crater. Nearby lay the grave of Lance Cpl. Blake A. Magaoay, 20, of Pearl City. Magaoay, killed in Fallujah on Nov. 29, 2004, was the first Marine from Hawaii to be buried in Punchbowl. Then, as taps was played, two Marines held the American flag high in front of Tsue's family. They then gently folded it, turning it over to Capt. Lawrence Goshen, who commands the 1st Explosive Ordnance Disposal Company at Camp Pendleton. Goshen presented the flag to Richard Tsue. Another American flag was given to Tsue's mother, Debra Takemoto, by Gross. Tsue's ashes were laid in Niche 312 in Punchbowl's Court 9, joining the seven other service members from the islands killed in Iraq and Afghanistan since the war began.